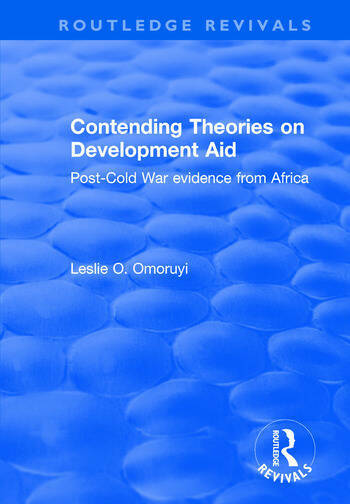 This title was first published in 2001: This thorough and comprehensive examination of the nature and pattern of post-Cold War aid to sub-Saharan Africa provides incisive, comparative case studies of the motivations behind the foreign aid policies of key members of the Development Association Committee (DAC). In one of the most rigorous contemporary efforts to evaluate the adequacy of the dominant theories of international relations on an important subject like foreign aid, Dr Omoruyi eschews easy answers to the problem of Africa's marginalization in the international system. He provides thoughtful, innovative suggestions for promoting a new development partnership between industrialized countries and Africa using a sophisticated quantitative method of inquiry, making this text a valuable contribution to social science literature on research methods. Contents: Introduction; Scholarship on the motivation question: pieces of a similar puzzle; Variables, hypotheses and methodology; The findings: realist lore and liberal principles: another case for muted optimism. The Study of Four Cases: France: the enduring salience of Besoin de Rayonnement; Japan: a rear entry into great power rank; Norway: the inexorable influence of national role conception? ; USA: simultaneous tides of retrenchment and recommitment; Rethinking aid to Sub-Saharan Africa in the new millennium: enduring threats and opportunities for a new partnership; Appendices; Bibliography; Index.